Tusk, therefore, remains the frontrunner. The biggest question is whether Tusk, who has served as Poland’s prime minister for the last seven years, is willing to bring an end to his career at the apex of national power just to take an uncertain role sparring with Juncker and national EU leaders like German chancellor Angela Merkel for the next five years. With Polish parliamentary elections due before October 2015, and with the conservative and nationalist opposition narrowly leading most polls, it seems like a riskier bet for Tusk to fight for a third consecutive term leading a government dominated by his center-right Platforma Obywatelska (PO, Civic Platform), with Jarosław Kaczyński, the former prime minister and twin of his late brother, a former president who died in an airplane crash four years ago, is likely to win the election for his own Prawo i Sprawiedliwość (PiS, Law and Justice). It seems like a much better gambit to let Sikorski remain in Poland, and try his hand at retaining power as Civic Platform’s new leader and go to Brussels. 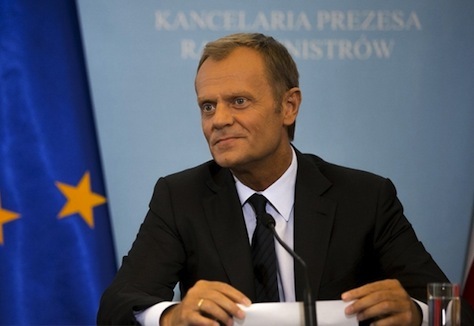 Tusk, if chosen, would be the first central or eastern European to win such an important EU position. Merkel has long preferred Tusk as her candidate, unofficially, and British prime minister David Cameron boosted Tusk loudly and publicly in the past week. European leaders might jump at the chance to give Cameron a victory after his disastrous campaign earlier this summer to stop Juncker’s Commission presidential candidacy. With Mogherini settled as the equivalent of Europe’s foreign minister, Italy’s prime minister Matteo Renzi would happily support Tusk for the Council presidency, and France could probably agree to a Tusk presidency if its own candidate for the Commission, former finance minister Pierre Moscovici, is guaranteed an influential and weighty portfolio. Though Tusk is a center-right official, he’s much more moderate than the social conservative and often eurosceptic leaders in the competing PiS. His biggest drawback is rather technical — he speaks little English or French, the two languages most used to communicate within EU policymaking. 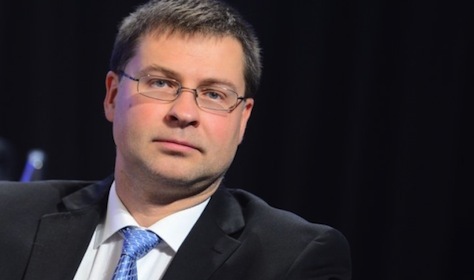 If for some reason, Tusk declines, Dombrovskis (pictured above) could become a contender. Like Tusk, Dombrovskis is a center-right eastern European. An economist, Dombrovskis served as Latvia’s finance minister from 2002 to 2004, and he most recently served as the leader of Latvia’s center-right Vienotība (Unity), leading Latvia as prime minister from 2009 until January 2014. Under his leadership, Latvia pursued relatively aggressive budget discipline and ‘austerity’ policies to avoid being pulled into Europe’s sovereign debt crisis, and he prepared Latvia for its accession to the eurozone on January 1. He resigned, however, over the tragic collapse of a supermarket roof in Riga, the Latvian capital, last November, which killed 54 people. 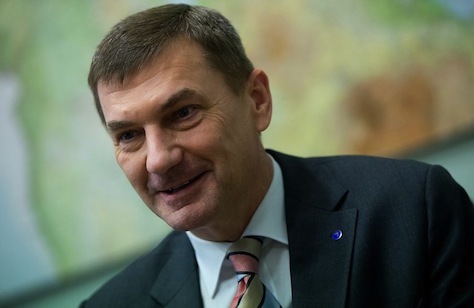 Another alternative is Ansip (pictured above), a more liberal version of Dombrovskis, who comes from Estonia, to Latvia’s south. Like Dombrovskis, Ansip felt compelled to purse an austere economic course for Estonia during his premiership, which spanned three terms from 2004 to 2014. He stepped down earlier this year as prime minister with the express desire to become Estonia’s commissioner. The chief difference from Dombrovskis, whose Latvian party Unity is part of the mainstream center-right European People’s Party (EPP), Ansip’s Eesti Reformierakond (Estonian Reform Party) is part of the liberal bloc in the European parliament. Katainen, who served as Finland’s prime minister from 2011 to 2014, and who also resigned in favor of becoming Finland’s commissioner, is less likely. Though he was a dark-horse contender for the Commission presidency, he’s a solid center-right European federalist and his country’s proximity to Russia means that it has many of the same security concerns these days, Finland is generally considered more ‘northern’ than ‘eastern’ — it was never part of the Soviet eastern bloc, and it joined the European Union in 1995, not in the 2004 expansion. If the Council leaders want a center-left figure as its next president, the general consensus is that they will turn to Thorning-Schmidt (pictured above). A relatively popular prime minister in Denmark, Thorning-Schmidt leads the Socialdemokraterne (Social Democrats), the largest partner in what’s now a two-party coalition in government. Though her party did better than expected in the Ma 25 European parliamentary elections, Thorning-Schmidt will have a tough battle in national elections next year, and she was considered Cameron’s favorite alternative to Juncker as a potential Commission candidate. Though Cameron and Merkel are now both in favor of Tusk, they would easily become comfortable with Thorning-Schmidt. Fluent in English and French, Thorning-Schmidt would add some Scandinavian cosmopolitanism to the Council presidency. But she has recently ruled herself out as a candidate, and with Mogherini’s appointment likely, it’s not certain that the Council would appoint another center-left official as its president. Previous PostForecasting the EU power summit, part 1: Europe’s next high representativeNext PostTusk, Mogherini appointed to top European offices. What next?